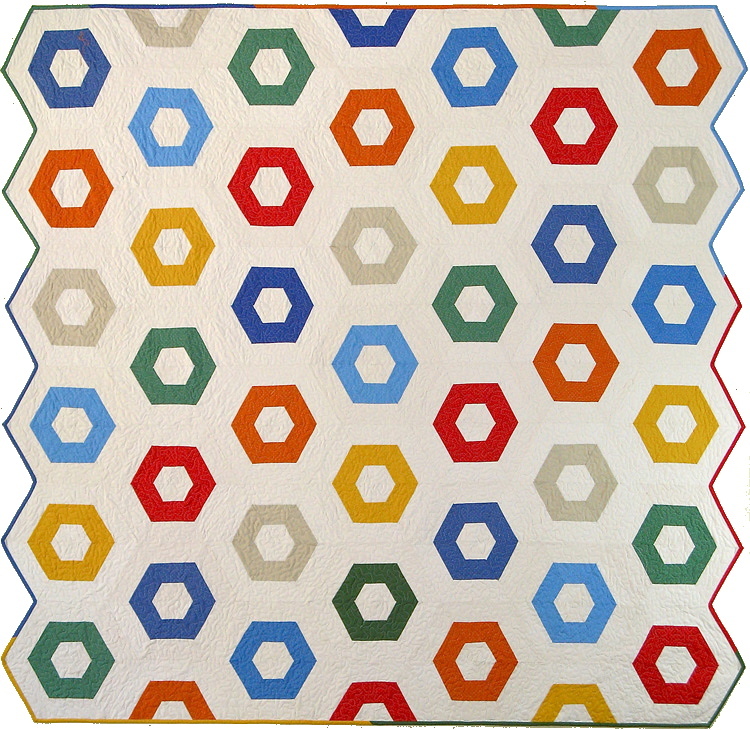 You know how much I love Hexagons and I am a massive strip piecer. Combine the two and that tells you about my quilt show n tell for today. I made this quilt from a pattern from Sandy Klop of American Jane. Here is the info from Sandy’s website describing the pattern. It is no secret that I am also a dotaholic so this binding was done using a variety of mini pindots. The year(S) of the pieced backs, etc. Sandy’s quilt used two jelly rolls from the same collection. decided to complete the quilt using the next American Jane collection. I think this made me one block short so I improvised by making one block that has all different sections. It is my favorite block in the quilt as shown above. I jumped on Sandy’s website to reference the Merry Go Round pattern number and look what I found!!! More stripped pieced hexagon projects to add to my list! Geez Louise, Does she ever sleep? Life savers and fruit flavors found in mother’s purse are the best ever when you have to wait. This quilt is eye candy wherever it goes. This quilt was made using American Jane Pin Dots by Moda. Cart wheels, spinning tops, ferris wheels and polka dots all spell fun! This quilt was made using American Jane Pin Dot, Fairy Tale Friends, Pezzy Print, plus Moda Bella Solids, and Essential Dots. I love the name of this pattern. This is a block I have been waiting to do. You need 3 groups of fabrics, light (plaid), medium (florals), and darks (pin dots). Making this quilt is way more fun than a camp lanyard, so why not make a Y-Knot. WOW…I love your 'favorite' block in the Merry-Go-Round quilt…as for being a dot-a-holic, I'm one too. I can see why 'Assorted Flavors' is eye candy wherever it goes…that would be my favorite. Have a wonderful Wednesday!! flying circles , hard choice though I had to keep coming back and looking at them! love the life saver reference and I am really drawn to solids lately this one speaks to me too!, oh how I used to love the 5 flavor life savers as a kid! and the name Y Knot is just fun! I love American Jane patterns and fabrics. Love them all! I love to see variations on hexagons and these are lovely. IF I had to pick I guess I would pick the Flying Circles quilt. 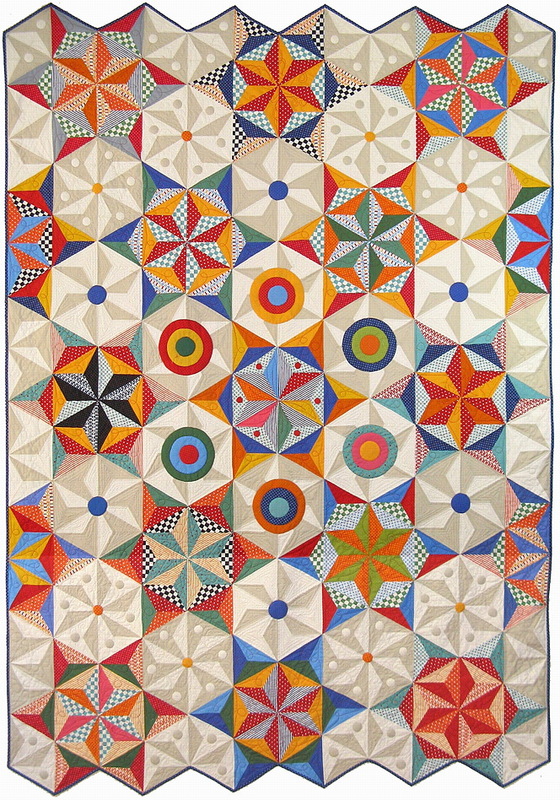 The pieced neutral blocks are so interesting and set off the bright colors of the star blocks. Ingenius! I have many projects so rarely buy a pattern but I jumped on and ordered Merry Go Round. I think I can do this hexagon one. I love the website, never been there before, many fun patterns. Thanks for sharing! Love the different take on the hexagons! Glad to know I'm not the only one who runs out of fabric in the middle of a project. Live all the AJ quilts but Assorted Flavors plays well with my memories and Life Savers,one of my favorite treats. Merry Go Round and Assorted Flavors are my favorites. I just might have to make both of them. 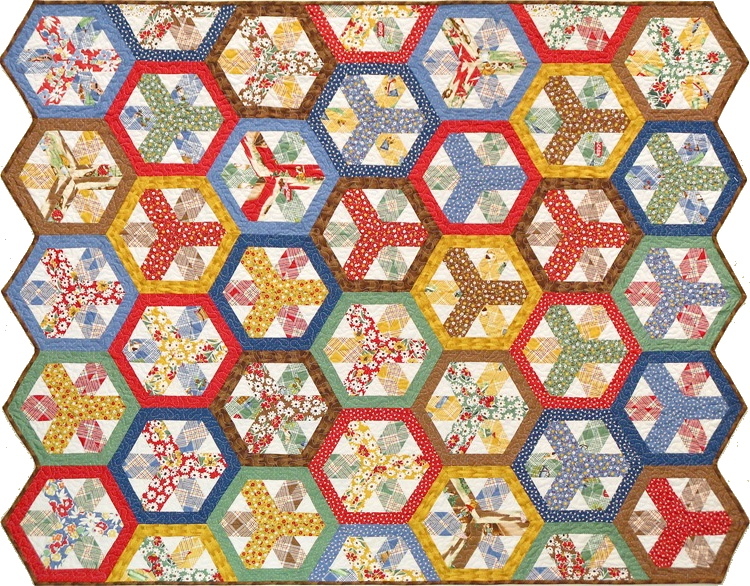 I love the Jelly Roll hex's I'm so going to try those! Hard to pick a favorite, but I think it is Flying Circles, love her patterns! My Favorite is the flying circles. These are wonderful quilts, especially Y-knot. Oh, man. I love them all. Sandy is just my perennial favorite!! Lissa, do you ever sleep? Your quilt is gorgeous!